Assistance Hearing or Seeing dogs allowed only. RIDGEWAY LODGE -more than just a bed and breakfast. 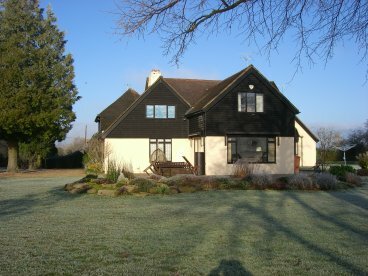 Ridgeway Lodge is ideally situated whether walking the Ridgeway Path, which passes the drive to the house, arriving by train from anywhere between London and (Stratford -on-Avon?) Birmingham, (10-15 minute walk from the station), easy access from the motorway network, or from Heathrow or Luton. Just 1 mile from the town centre of Princes Risborough our Bed & Breakfast is situated on the Upper Icknield Way, The Ridgeway long-distance path, and is in the Chilterns AONB. The house sits in large gardens, surrounded by farmland,with far-reaching views towards West Wycombe, Loosely Row and Lodge Hill. Guest's front door, hall, access to the Studio and door to annex accommodation,kitchenette and lounge/dining room. The Studio, a large, light room on the first floor, with an ensuite shower room. The sleeping accommodation can be used as either twin beds or a superking bed, with space for an extra bed or cot for a child. The room is reached by a private staircase fitted with a handrail. Coffee and tea-making facilities are provided. Digital TV, radio/alarm. The ground floor annexe has king and twin bedded rooms,each with a digital TV. Bath/shower room. Only one of the rooms is let at a time in order for guests to have a private bathroom, but both rooms can be booked for a family or group of friends. Easy access for less able guests, level floors, with only one small step over the entrance threshhold. More than just a bed and breakfast- For the use of all guests,there is a sitting/dining room/breakfast room,also with a digital TV and DVD player,(bring your own DVDs) with French doors to the garden. Breakfast is taken in the dining area, where there is also a kitchenette with tea and coffee making facilities,china,glass and cutlery, microwave oven/grill, fridge,small induction hob, toaster and everything needed to cook or heat up a meal if you don't want to go out in the evening. Some local restaurants do take-aways. If preferred, there are several good eating places within easy reach, either on foot or by car. There is plenty of off road parking, and secure storage for cycles. Only Assistance Dogs are permitted, as our three nervous rescue cats, which are not allowed into the accommodation areas because of allegies, are not used to having dogs around, and the chickens are in the garden. Miv and John are happy to answer any questions and show the accommodation to prospective guests.